This was our first Halloween in the Old Vic…we had no idea what to expect, but figured it was a worthy house to have a fun Halloween in and we’d decorate a bit. 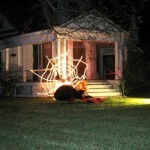 In our surburban “blah” house in Garland, Halloween had faded away. The number of kids sliding each year and the effort they put into the costumes fading into nothing. Even so, in our new small town, we figured (and it turns out, rightly so) that it would be a good holiday. 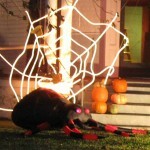 I wove a spider web out of 150′ of rope light, and then had to have a spider suitable to go with it. A few pumpkins that we somehow never got around to converting to jack-o-laterns added some fall festiveness, and a bunch of red lightbulbs cast an appropriately eerie glow over the entire thing. I was a pirate, and the wife was a cat-lady (Rowr!). Sorry, no pics of us (we forgot). Maybe next year! We figure we’ll add one major decoration each year. This was it for this year, as time was limited for setting things up. In future years we’ll light the tower as well. We had LOTS of kids. Well over 100. Probably closer to 200. Most had great costumes and showed that they had made some effort. All were polite and behaved. Many “knew” the house was haunted. All in all, a good time. We probably gave out 50 pounds of candy, insuring dentists everywhere will have work in the coming year. This entry was posted in Wierd and Wonderful, Yard. Bookmark the permalink.